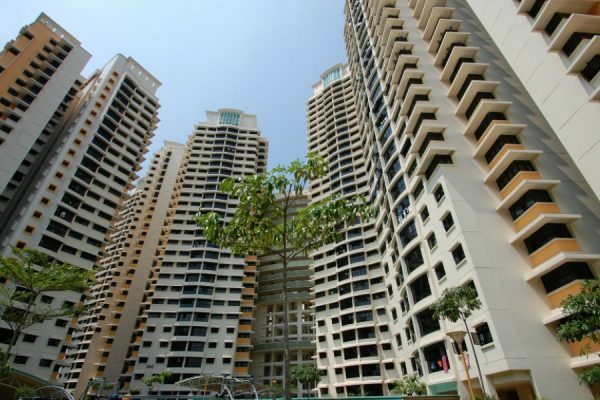 One of the most debatable topics among Singaporeans, should you get a resale HDB flat or not? A controversial topic that most Singaporeans love to moot about especially when it is pitted against a BTO HDB flat. If you have made up your mind or if you are leaning towards resale HDB flats, we shall not dissuade you, but rather here are a couple more reasons to validate your decision and hopefully allow you to make a better, more decisive decision to secure a resale HDB flat of your own today. 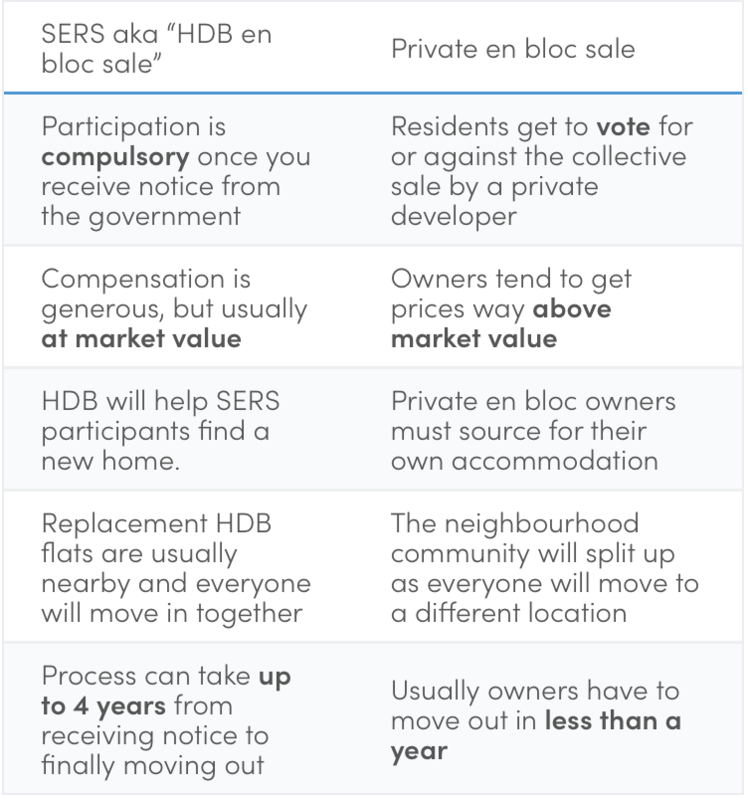 SERS, also known as Selective En Bloc Redevelopment Scheme or Singapore’s En Bloc Sales, where homeowners would deem it being an equivalent to striking a 4D or lottery. These homeowners would be informed by the government that their HDB flats would be acquired by either the government themselves to re-develop into a new BTO development, or a condo development, or shopping malls and facilities. In return, each unit would be compensated with a generous amount depending who is purchasing that plot of land, either the government or private developers. SERS would only happen under these two scenarios. A HDB en bloc sale or a Private en bloc sale, both en bloc sale would ultimately benefit the residents of that particular en bloc development, but here are some factors that would differentiate them apart. WHAT WILL HAPPEN TO THE RESIDENTS OF SERS? Homeowners would then be aided to purchase a brand new, fresh 99-year old leased HDB flat at a subsidized rate, these HDB flats would typically be around the vicinity of their previous houses. With that in mind, if you were to have a buyer offering you a generous amount to take over your unit, thereafter, assisting you to purchase a brand new 99-year old HDB flat for a discounted rate, most homeowners would take the leap and go for it as it is a situation that is hard to decline for any Singaporean. Most homeowners would make a handsome profit out of it at the end of the day, or even retire early. VERS, also known as Voluntary Early Redevelopment Scheme, is not commonly known to many Singaporeans or PRs. VERS is somewhat like a lucky draw, it allows residents of that development or homeowners to come together, voluntarily give up their flats for redevelopment. This usually happens and can only happen if the estate is coming to the end of its lease. The VERS scheme would aid the government crucially when it comes to the properties in Singapore over a span of 20 – 30 years instead of taking back all the HDB flats and redeveloping them all at once, which would require a significant amount of manpower and many families would be left homeless if it were to be done all at once. 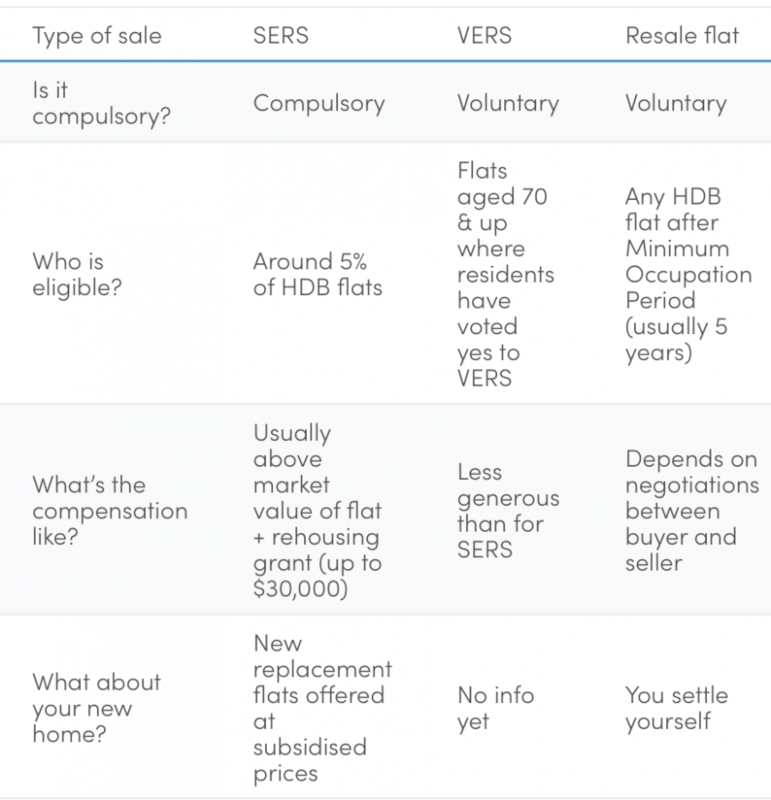 HDB homeowners who would like to enter the VERS scheme would only be eligible if they have not been offered a SERS scheme. At the moment, there are no HDB flats that are mature enough in terms of lease to kickstart VERS and see if this VERS scheme or the SERS scheme would be a better financial choice for homeowners. Matured HDB Flats that are within walking distance or closer to central locations or MRT stations would stand a higher chance of redevelopment or the government accepting their estate under the VERS scheme. Upon successfully being chosen by the government, the homeowners would then be given the right to vote if they wish to proceed with the redevelopment or not, as this would mean shifting to another place which may or may not complicate their lives. Residents under VERS would be given the choice to vote: “To sell their HDB flats back to the government near maturity of at least 70 years.” The monetary compensation when it comes to VERS would not be as attractive as those who fall under the SERS scheme. This would translate that in certain cases, homeowners might even need to top up for their new HDB Flat if the compensation is lower than the valuation of the new HDB unit. The government has not implemented or rule out the possibility of allowing private developers to take over HDB Flats that are under the VERS scheme, but in the event if they were to be included, priority would still go to the redevelopment of new public housing HDB estates. This is no good news for those who are under the VERS scheme as they MAY NOT make a profit even if their en bloc were to be privatized. End of the day, the decision is solely yours to make. There is no right or wrong when it comes to getting a resale HDB flat. Afterall, aren’t we all seeking an ideal location, a shelter and a place to build a dream home of our own? Do note that you would be taking over as a second hand homeowner and therefore, you should also look further as to how many years would you be holding onto this HDB Flat and plan ahead. Would this be a form of investment added to your investment portfolio, or a home for your family to settle in? Take into consideration the number of years remaining and if the flat is only left with 35 years of less, there would be a huge plunge of valuation towards the end of the lease. Take that into serious consideration and be it purchasing a resale flat or a new BTO flat, all homeowners are tenants to a 99-year old leased flats from the government, unless you foresee or have a strong hunch that this development would be a potential SERS scheme, do not pour your hard-earned money solely into a resale flat as an investment.